Home > Beaded Curtains & Columns > Crystal Ceiling Drapes > COMING SOON! 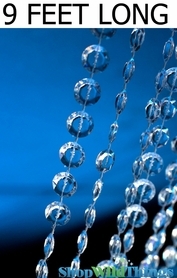 Diamonds Non-Iridescent Ceiling Drape & Canopy - 15 Feet Long - PREMIUM QUALITY BEADS! Create a dazzling effect with our diamond-faceted ceiling drapes and canopies from ShopWildThings. The clear, faceted beads capture and reflect the light for dramatic production sets, stage designs or art center and corporate galas. Each curtain is 20 inches wide and 15 feet long. 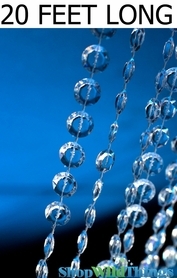 Watch our video on this page for a quick, entertaining guide on how to hang a beaded curtain. The four attachment points on four attachment rods on our silver rod make it easy for two people to hang from a ceiling for a catered dinner, formal dance or other special event. Read our rave reviews from customers. 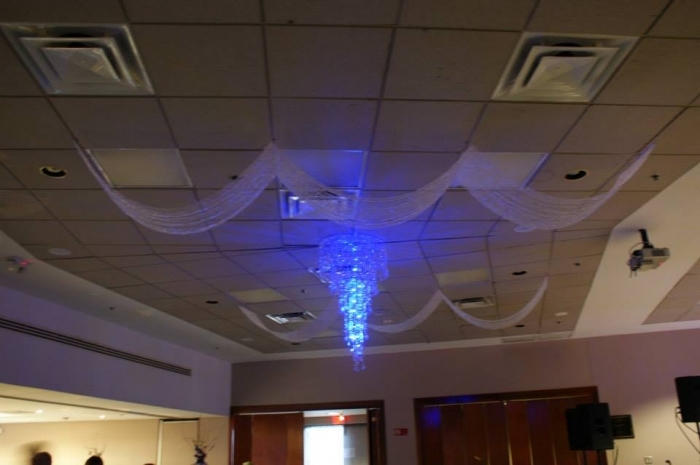 One customer said it took two people just three minutes to install this diamond bead ceiling draping using our optional heavy-duty mounting magnets. 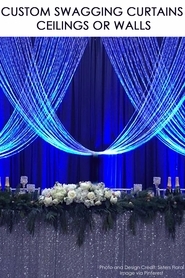 Create a canopy or gazebo effect by hanging part of a diamond drape from the ceiling and allowing the rest to hang down to the floor. Cover part or all of a ceiling. For home interior designs, drape them around a bed for a "wow" effect. Add sparkle to plain wood ceilings at outdoor pavilions when decorating for an outdoor wedding ceiling canopy or elaborate outside VIP cocktail party. Visit our Decor Photos & Ideas page to see the stunning results achieved by major TV and film studios and professional event planners to inspire your project. The best decoration for any event. I purchased this ceiling drape for an office decorating contest. It was the main event. Everyone loves it. It is a very beautiful piece, Super easy to put up. Great for weddings, special events or to just beautify an area. Worth every penny!! I USED THIS FOR MY DAUGHTER'S WEDDING HEAD TABLE. IT WAS EVERYTHING THAT I WAS EXPECTING. I JUST WISH I HAD ORDERED MORE. ConsIT WAS A LITTLE TANGLED BUT WE GOT THROUGH IT. This was my alternative to having a chandelier. So glad that I was able to order and hang before my grand opening. Thank you!!! Absolutely stunning. Packed really well. Extremely easy to install. Lightweight, but stunning in appearance. 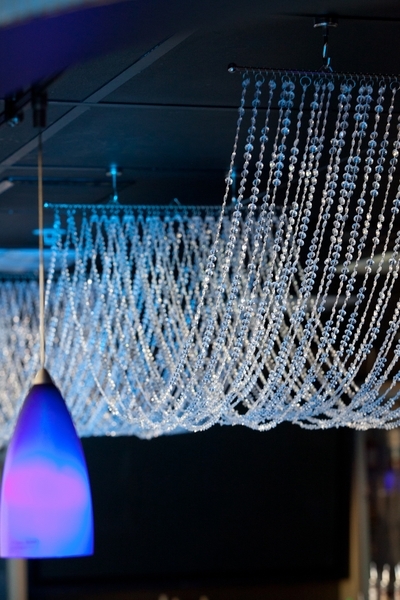 Picks up lighting and makes a nice ceiling hanging adding to a festive, glamorous image. Merchant Response:We are so glad you loved your ceiling drapes. We love them too. 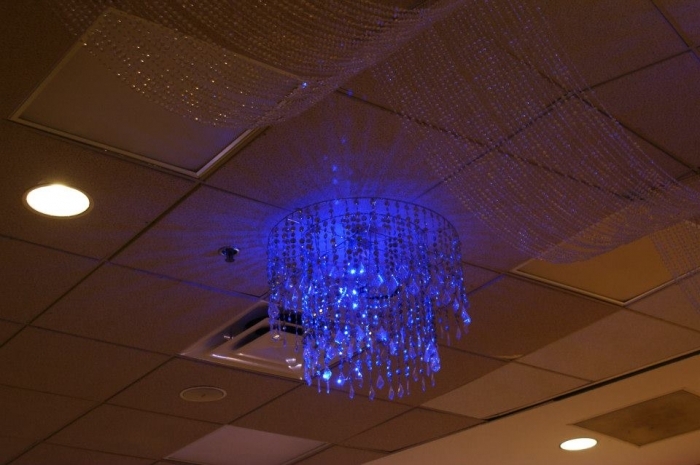 They add so much sparkle and glamor to any space. ConsNot really a "con" but just added info. It did take 3 of us ladies to put it up. One holding on one end; one in the middle and third actually putting it up. I was worried about tangles reading the other reviews, but mine was packaged very nicely with each section tied off, so it came out of the box like it was supposed to hang. I am using this to make a princess canopy in my daughters bedroom and this definitely makes her feel extra special. I absolutely recommend. High quality, fast shipping and cannot buy anywhere else. Merchant Response:Thank you so much for taking the time to post a review. We are thrilled that your princess is happy with her canopy. 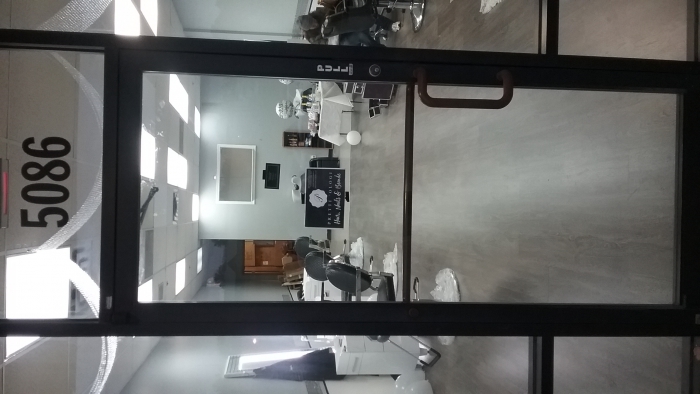 I used the ceiling drape in my salon and it was the perfect look I was aiming for! ProsWill give a touch of elegance to any space. ConsDefinitely a job for 2 people. This item added such beauty and elegance to our daughters graduation celebration. Simply Gorgeous!! Beautiful item. Contrary to other reviews...I thought it was easy to put up. If you take it out of the box correctly...and leave the "ties" as they indicate (until after you're finished hanging it)...you should be fine. BUT...it takes 2 people. Too awkward for 1 person to hang. Reflects the light beautifully...if, for example...you point a disco type bulb on/at them. I received the wrong item the 1st time I ordered it. Got 9 ft. - instead of the 15 ft. I have to give the 5 starts...because 1) the item is beautiful as described...and 2) they were awesomely quick about re-sending the correct item. The "return" was a breeze too! Merchant Response:Thank you for your feedback and for being a wonderful customer! ConsNone. Get 2 people to hang it...and you're good! Beautiful to look at, a pain to hang, take up down. Tangles too easily. The way it came could havebeen ppackaged better. Took 2 hours to untangle. I purchased this and two crystal columns for my niece's wedding. They were spectacular. We couldn't have been happier with them. These drapes are sooo perfect & elegant looking. I originally ordered only one...once i received it , I promptly ordered 4 more. Merchant Response:We love these too and when something is sooo beautiful, 1 is simply not enough! Hooks you say? Type hooks in the keyword search to see a variety of choices. Conshave to purchase hooks separately, which can be expensive if ordering more than one. Love that is easy to install with the Heavy Duty Mounting Magnet. You don't waste time, in less than 3 minutes it's on! !, and beautifull. 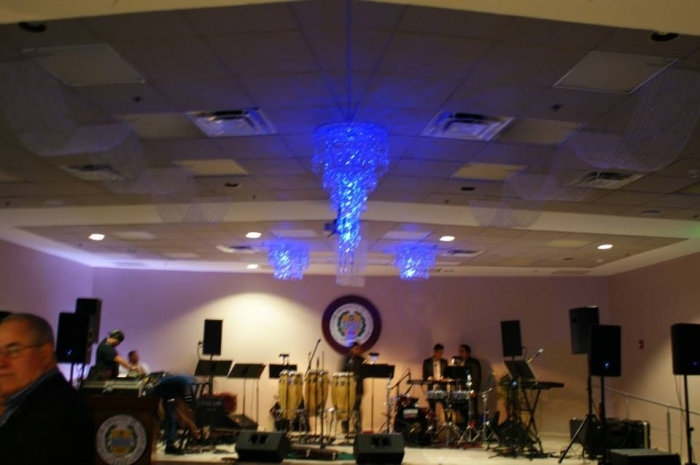 Add any chandelier and your event will be amazing. ProsYou can install it easy and fast. No more ceiling drapes.